My collection of favorites! Everything pictured above is what I recommend! Click on this link for Holiday Sets! Love this cosmetic case the products came in! So excited to finally be sitting here writing this out for all of you! After 2 years, I am finally partnering with Tula, and sharing my skincare favorites with all of you. Yes, this is sponsored. Yes, all of my opinions are entirely my own or I would not have accepted this partnership. I only partner with brands that I genuinely use and love. When we were living in Florida, I went on my Instagram stories to ask you guys what I should use for my dry, sensitive skin. My skin wasn't balanced, dry no matter what, and just dull. After my DM's were flooded with Tula recommendations, the brand so kindly reached out and offered products for me to try! I will forever be so grateful to all of you that introduced me to this brand! 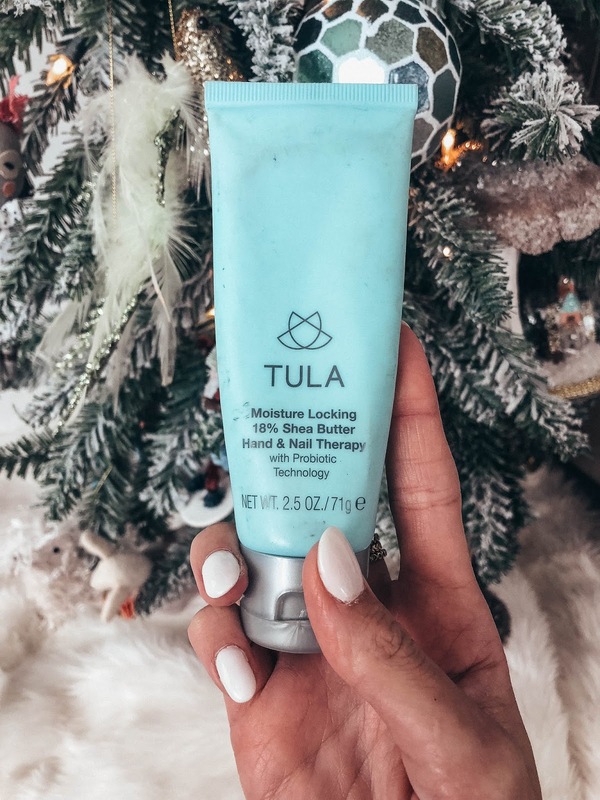 After trying so many different brands and products, Tula has always been the skincare brand that I have gone back to time and time again. Even when I was trying different products, I was still using my 2 absolute favorites - the Purifying facial cleanser and Hydrating Day & Night cream in my routine. These products are the 2 that I recommend for everyone to try first. Another favorite is the Multi-Spectrum Overnight Skin Rescue Treatment. This is so perfect for the winter when my skin is extra dry and sensitive. I apply a layer of this to my cleansed skin at night, and wake up with softer, more plumped and radiantly hydrated skin. The Moisture locking hand & nail therapy is ALWAYS in my purse and nightstand. I actually have one in the kitchen too! I can't live without this cream. It does it's job without leaving my hands greasy. I may not have shared this here before, but I have a problem called Hyperhidrosis in my hands, which means they sweat more than normal (yes, its still embarrassing even after all these years of dealing with it!) With that said, I have a horrible time finding creams that don't make my hands excessively sweat... until I tired this. 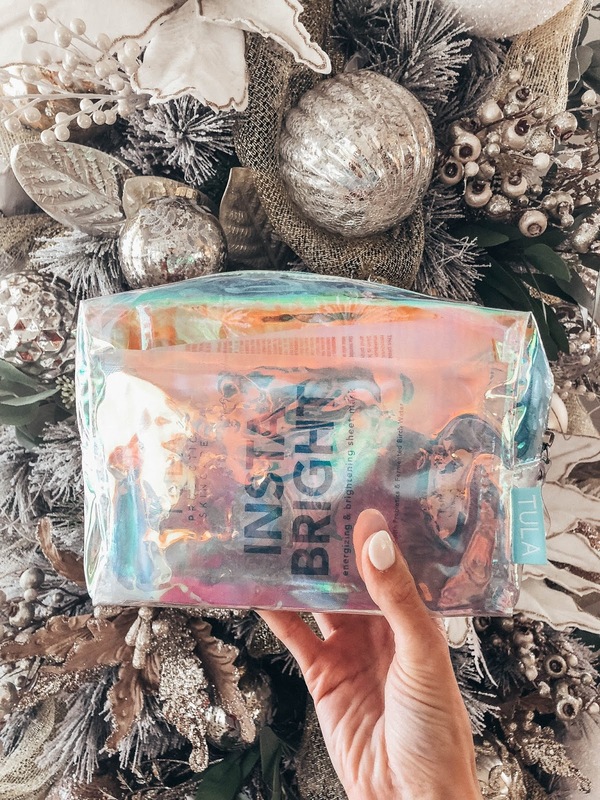 It absorbs right into my skin and works amazing right through the winter! It's hard to choose just a few product favorites to talk about, as I have so many. The multi-spectrum eye renewal serum is wonderful and I love the cooling applicator! I have a hard time finding an eye cream that doesn't give me small bumps around my eyes.. this is perfectly balanced, and clinically proven to reduce the appearance of wrinkles and puffiness! You really can't go wrong with trying Tula. You've got a wonderful chance that it will work beautifully for your skin, and that's a chance I wasn't willing to pass up. Thank you all again! I'm so grateful! If you would like 20% off your purchase, use code LITTLEBLONDE. This offer is not valid on gift cards, previous purchases, or auto shipments. Offer is valid on full price items, starter kits, holiday sets, and the acne clearing kit! Thank you all so much for taking the time to read here, and thank you again to Tula for partnering with me! xoxo!